Project:Making a Full-Sized Egg Carrier in Minecraft. Might I suggest different sizes of splashes for different speeds of exiting the water, or some comparable effect? Also, perhaps adding an underwater effect when Sonic is jumping into water? Just a nice little hoard of bubbles, for example. Again, the depth that the bubbles sink could be determined by Sonic's entrance speed. I might as well say something, this place has been a ghost town for a while. Just like in the 'Sonic 2 Enhancement Theory' clip, it'd be awesome to have echoing in the caves. I don't think motion blur would do any good to game play, it'd just make things harder to see. Oh, oh, the lava sound in that video would be cool to (plus the glow effect). Yeah, we saw that already. A couple ideas in that we were already considering, but I dunno what we'll use and won't use in the end yet. I'll probably give it a better look over when I don't have a constant pressure headache going. Are you planning on adding a level select code to this? 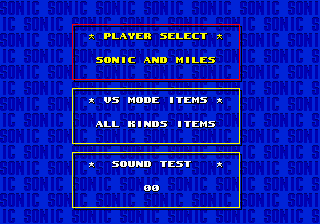 If so, don't make it so long and annoying as the actual sonic 2 one, something more like up-down-left-right a+start is fine. Also, if you do, could you provide a way to get to the final boss without chaos emeralds, it that'd work. Also, if you do, could you provide a way to get to the final boss without chaos emeralds, it that'd work. ...You never need them for accessing any level. I'm fairly certain the level select will be a more traditional style thing once it's implemented. It'll be awhile before that happens, though. Since the options menu is going to be completely different, might it be worth implementing the level select in the original option menu style?